Welcome to OLD Club. 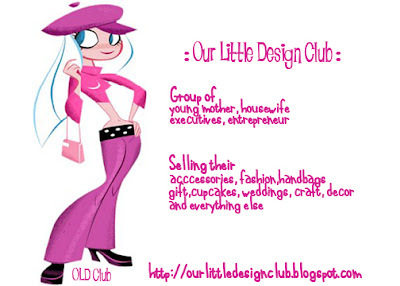 Our Little Design Club was inspired when i was chatting with one of the member talking about Malaysian Online Business. It is no doubt that this globalisation has created many housewife, mothers and even executives to step one foot into online business. Does not matter wheather u're a trader or the creator of ur own design / label. We all are trying to sell something to someone. Although we are only 2 years old but we have known many. We have our own idol and we learnt by mistakes and support from each other. So i was thinking, why dont we have our own club? Its more like a group where we young entrepreneurs meet other member, find new friends and exchange opinion and information. As an online businesswoman too, we understand how difficult sometimes it can be to promote our brand, to liase with strangers and building a repo & relationship with your customers. Especially when we faced 'dengki' people that have potential to egitate you. Well, however we strongly believes that 'seandainya tuhan tentukan rezeki itu milik kita, maka milik kitalah ianya'. Thefore we hope that this OLD Club primary focus is supporting one another , and providing a netwrok for all OLD Club Members to reach out to one another. extending wishes to all club members, WELCOME to OLD Club!